Greenwood forest park is a theme park with a difference. Best avoided by any couch potatoes this is a fun place to go for children and adults that have a bit of energy to spare. It’s also more environmentally friendly than the electricity drinking roller coasters of other theme parks. In fact at Greenwood park it’s you that power the roller-coaster! 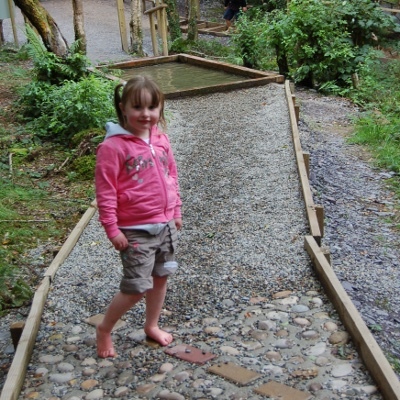 We visited whilst on holiday at Ty Mawr Park Resorts Camping and Caravan site. It’s at Y Felinheli in Gwynedd, North Wales. There is a bit of a rabbit theme at the park and on arrival greeting seams to swap between a giant rabbit mascot and an opportunity to meet a real life rabbit. There is also a little bunny village. The first ride we went on is one of our daughter’s favourite, the giant bouncy pillow. This is a jumping pillow a bit like a bouncy castle. Other places that also have these include Heads of Ayr Farm Park in Scotland and Ash end House Children’s Farm. After that we went around the Barefoot Tail – a path through the woods that you walk around barefoot feeling the different textures and materials through your feet. Next the boat ride saw us pulling, pushing and rowing our boat around a circuit. Great fun! There are also playgrounds, toddler’s play areas,large and small sledging hills, a sand pit, a maze and various craft activities. 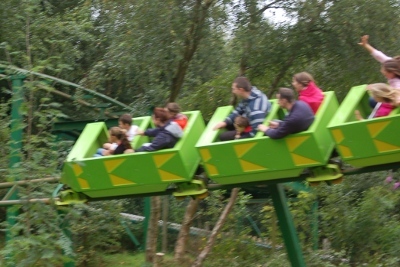 The big feature is the Green Dragon Eco-coaster. The worlds first environmentally friendly people powered roller coaster that actually generates more energy than it needs to run (depending upon the number of people riding). First you climb a hill to the top of a funicular lift. The weight of everyone on the funicular causes it to lower lifting the roller coaster to the top of the hill and also generating electricity. You then have to walk to the top of the hill again to get onto the roller coaster which runs around the site using gravity. Considering how environmentally friendly the ride is it’s actually quite fast and very enjoyable. A great way to burn off a few calories whilst having fun. The majority of this is aimed at younger children from toddlers to 10 year olds. There are some activities for older children, in particular the sledging hill, but they are likely to want the thrills of a normal theme park which the eco-coaster doesn’t quite compare. There is a cafe/restaurant on the site and some outdoor food points (hot dogs / ice creams etc.). There are good baby changing facilities and most areas were accessible with a pushchair (exceptions included Snowdon viewing platform, den building area, and the roller coaster which had toddler play area conveniently located nearby). A great place for a fun active day out. This entry was posted on Wednesday, September 2nd, 2009 and is filed under Babies, Children, General, Tourism. You can follow any responses to this entry through the RSS 2.0 feed. Both comments and pings are currently closed.